The chief town of jhalawar, also known as Patan or Jhalrapatan , was founded by Zalim Singh in 1796, by the side of an artificial lake. It was the centre of trade for the eponymous princely state, the chief exports of the which were opium, oil-seeds and cotton. The palace is four miles north of the town. 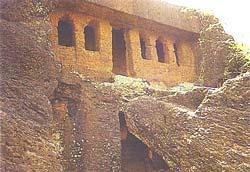 An extensive ruin near the town is the site of the ancient city of Chandrawati, said to have been destroyed in the time of Aurangzeb. The finest feature of its remains is the temple of Sitaleswar Mahadeva . Jhala Zalim Singh often came here for hunting and he liked the place so much that he wanted to develop it as a township. The objective to develop this place as a military cantonment was due to the fact that Maratha invaders passed through this central place from Malwa towards Kota to capture Hadoti states. Legendary Jhala Zalim Singh recognized the importance of this place and started to develop it as a military cantonment and township, so that he could use this place to attack and stop Maratha invaders before they can reach to Kota state. Chaoni Umedpura got developed as a cantonment and township around 1803-04 A.D. Colonel Todd, who visited the region in December, 1821 described this area as the cantonment established by Jhala Zalim Singh plus a well-established township with large houses, havelis, and surrounding walls. In 1838 A.D., English rulers seperated jhalawar state from Kota state and gave it to Jhala Madan Singh, the grandson of Jhala Zalim Singh. He developed his administration services to develop the state of jhalawar. He resided in Jhalara Patan for a long time and started to build The Garh Palace (1840 - 1845 A.D.). He was the first ruler of jhalawar state and made his great contribution in the history of jhalawar.